This newest edition of Broadcast Journalism continues its long tradition of covering the basics of broadcasting from gathering news sources, interviewing, putting together a programme, news writing, reporting, editing, working in the studio, conducting live reports, and more. Two new authors have joined forces in this new edition to present behind the scenes perspectives on multimedia broadcast news, where it is heading, and how you get there. Technology is meshing global and local news. Constant interactivity between on-the-scene reporting and nearly instantaneous broadcasting to the world has changed the very nature of how broadcast journalists must think, act, write and report on a 24/7 basis. This new edition takes up this digital workflow and convergence. 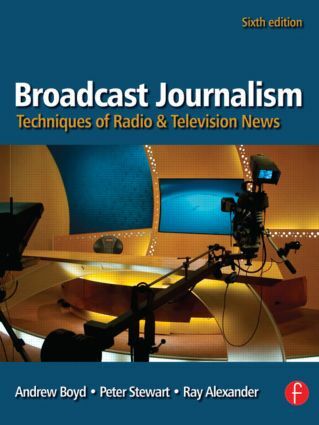 Students of broadcast journalism and professors alike will find that the sixth edition of Broadcast Journalism is completely up-to-date. Includes new photos, quotations, and coverage of convergent journalism, podcasting, multimedia journalism, citizen journalism, and more!